Pocket watches largely fell out of favor with the advent of wrist watches in the 1920's. However they continued to be made through 1969. In fact, excess inventory of pocket watch movements continued to be sold into the early 1970's. Pocket watches tend to fall into two categories... dress pocket watches and railroad pocket watches. Railroad pocket watches required a number of different attributes in order to be "railroad approved". You could argue there's a third category of utility pocket watches. Utility pocket watches have the appearance of a railroad pocket watch but, for whatever reason, are not railroad grade. 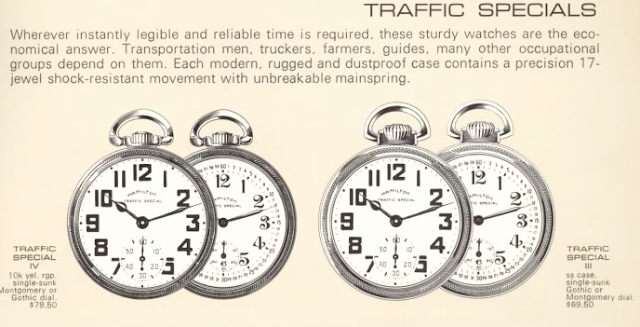 In 1955 Hamilton introduced an entry level line of pocket watches called the "Traffic Special". That line was also used in the 1920's with certain size 16 pocket watches that were used on trollies and street cars. 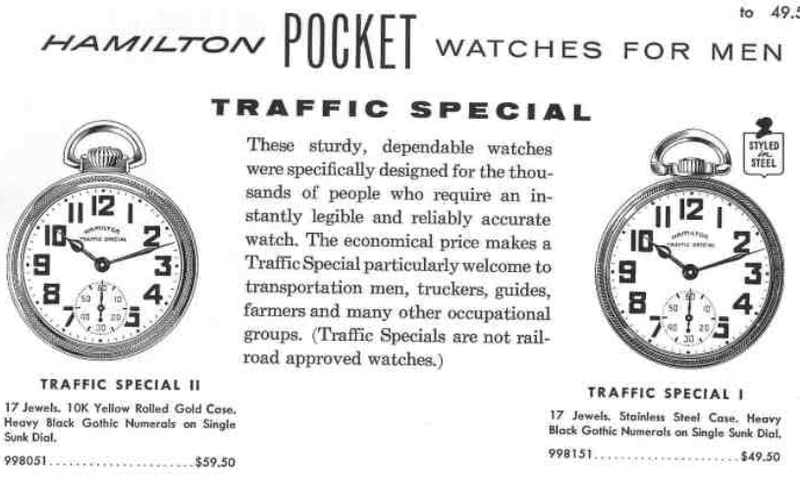 The Traffic Special line in the 1950's was priced at about 50% the cost of a railroad approved 992B model. They were intended for "working men" who wanted an accurate and easy to read pocket watch but without the price tag of a railroad grade model. Two models were introduced in 1955, the Traffic Special I in a stainless steel case and the Traffic Special II in a yellow rolled gold plated case. Both are size 16 watches and feature a Swiss-made Hamilton 669 movement with 17 jewels. Apparently the only dial option was a single sunk heavy gothic design. In 1958 the models evolved slightly and although the names stayed the same, the models appear to have swapped crowns. The Traffic Special I received the half onion style crown that was on the Traffic Special II prior. Then in 1960 another dial option was added, a single-sunk Montgomery dial. Both models continued to be produced through 1965. In 1966 the model line evolved again with the introduction of the Traffic Special III and IV. It's hard to tell what changed in the line though. I can't really tell from the catalogs alone. I believe the main difference was the utilization of a new Swiss movement, the 670 grade. The model line continued through 1969. I don't tend to pursue pocket watches very often. There are a lot of different models, just like with wrist watches, but pocket watches have limited utility. Given the choice of pursuing a pocket watch project watch or a wrist watch project, I will choose the wrist watch every time. That said, I recently acquired a Traffic Special because the price was right and I wanted to see what the model line was all about. I'm not really sure of it's age though. It has an early crown but the Montgomery dial. There are no serial numbers to date the watch so it's really a challenge to be more specific. The bow on my project watch is a little different than the catalogs too. Perhaps it's a replacement? It's tight and certainly appears to be original but I can't be entirely sure. The case back shows some wear, especially near the crown. RGP cases are no where near as sturdy as gold filled cases. That said, a light polish will do a lot for this case's appearance. The 17 jewel 669 movement looks like a giant version of other Swiss-made manual winding movements from the same period. I'm not sure who the maker is though. I did not see any marks under the balance to denote the Swiss company. The movement is positive set, like a wrist watch, so a set lever screw allows the stem to be removed. Then the two case screws can be removed and the movement drops out the front of the case. With the dial and hands removed, the front of the main plate looks like a giant manual winding movement. Removing the two screws holding the set bridge down allows all the setting parts to come off. On the reverse, the first things off are the winding and ratchet wheels. Then the barrel bridge can be lifted off. Without the barrel bridge in place, you can see the mainspring barrel contained within. That stores the energy of the mainspring and powers the watch. Next off is the train bridge supporting the center wheel, third wheel and fourth wheel. Now you're starting to see how the power from the mainspring is conveyed to the balance wheel. Next off is the escape wheel bridge. Now I'll remove the balance wheel. One screw holds it's bridge in place and then I'll lift the lot off as an assembly. With the balance out of the way, you can now see the pallet fork. The pallet fork flips back and forth with each pass of the balance and meters out the power of the mainspring one tick at a time. The back of the main plate is now clear of parts so it's now ready to go into the ultrasonic. One reason I don't tend to do pocket watches is they are too large for the baby food jars I normally clean parts in. For size 16 watches I need to move up to jelly jars. While everything is being cleaned, I'll turn my attention to the acrylic crystal. It's a bit hazy and scratched but a few minutes on the polishing wheel will bring it back to new life. Laid out in the photo below, you can see that a pocket watch looks pretty much the same as any manual winding watch. The only difference is the size of the parts. Pocket watches are much larger and probably a little easier to work on. It's all back together now, just by putting each part back on in the reverse order I took them off. The only exception is the balance, I put that on last after winding the watch a little. The watch is now ticking away so it's off to the timer to see how it's doing. Pocket watch movements always make my timer look so small. Looks like it's running fine. A slight tweak to the regulator will speed it up slightly. Now that the movement is running great all that's left is to put the dial and hands back on and tuck it back in it's case. With a freshly polished case and crystal, this watch looks as good as it runs. The Lord Lancaster line of watches was introduced in 1963 and was comprised of various models that all featured diamonds on the dials. Diamonds were first offered on dials in the 1940s as special features added to otherwise plain models but it wasn't until the Lord Lancaster line came along that diamonds were the principle feature of the model. One of the first Lord Lancaster models was the Lord Lancaster A. It was produced through 1965. If the Lord Lancaster A looks familiar, it's could be because it's based on the 1962 Gary. 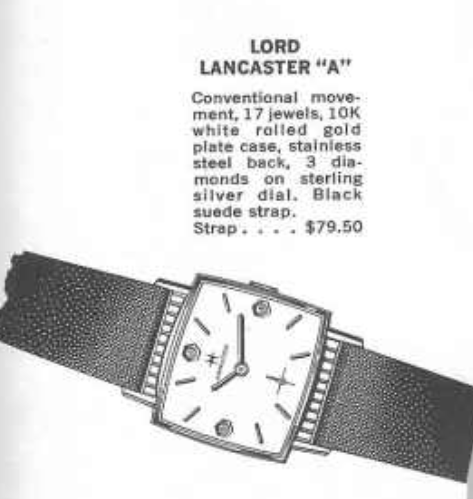 Most, if not all, of the Lord Lancaster models had a non-diamond dial sibling. One of the features that makes the Lord Lancaster line unique is the models usually came in white gold, gold filled or rolled gold cases. However, there are few yellow Lord Lancaster models too - so there's an exception to every rule. The Lord Lancaster A came with a 10K white rolled gold plated bezel and a stainless steel back. Tucked inside the case is a 17 jewel Swiss-made Hamilton 686 movement. You see a lot more Garys than you do Lord Lancaster As. They are few and far between but not necessarily rare. I recently purchased a Gary project watch. In fact, there were two different watches sold within a day or two of each other and I was fortunate enough to snag one of them. As it was received, it was in very good shape. Unfortunately the minute hand was out of position and the tip lightly rubbed the crystal, leaving a slight circle on the inside. The stainless steel back is unengraved and looks almost new with a light brushed finish. The 686 movement is based on the A. Schild 1200. This one is a little dirty but otherwise looks unremarkable. It's a very simple movement and very easy to a adjust so fine-tuning it is a breeze. Everything has been cleaned and dried. I was able to polish the inside of the plastic crystal and buff the circular scratch out. So now it's just a matter of putting it all back together with fresh lubricants. Everything is back together and the balance is swinging with good motion. Now it's off to the timer. Right on the money... nothing to do with this movement but put it back in the case. The dial on this example shows it's age but my camera makes it look worse than it really is. It has a few light spots but otherwise looks pretty good. The Lord Lancaster models usually came with black suede straps but I think this black croc-grain strap looks just as good. "You got to know when to hold them. Know when to fold them..."
The mid-1950's was a period of great innovation in Lancaster, PA. Over the span of just three or four years Hamilton introduced new models with self-winding movements, date complications and even the world's first electric-powered watch. Many models were still made "the old fashioned way" but the watch industry in the United States was more competitive than ever. Post-war Europe produced high quality movements at extremely competitive price points. Eventually Japan joined in. In fact, you might say it's still tough out there as the Chinese make many of the watch movements used today. 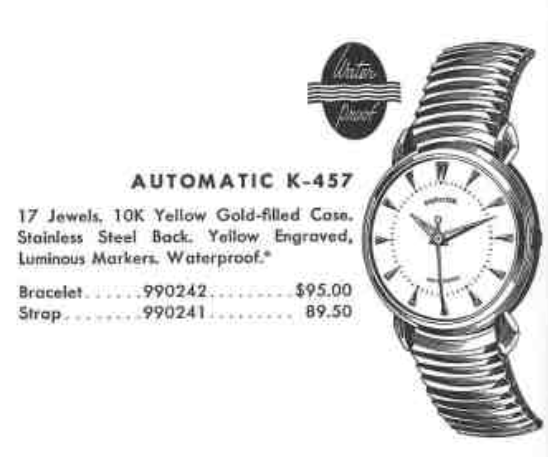 In 1956 Hamilton introduced the Automatic K-457. It would be produced for three years. $90 may not seem like a lot today but back in 1956 that was equivalent to $790 today. So the K-457 was not a cheap watch. However, Hamilton trimmed costs by using a stainless steel back. Like all Hamilton automatic models, the movement was Swiss-made. In the case of the K-457 it's a 17 jewel 661 grade made by Kurth Freres. I recently purchased a K-457 project watch and I thought I'd be able to work some great magic on it. As arrived, it was not running and I couldn't even turn the crown to set the time. What was really odd was the dial was toned on one side but not the other and it looked like it was a little smeared too. The screw-off stainless back was unremarkable - that's usually a good thing. I hate to see when a back has been buggered up by someone hacking at it with something to try to get it open. This case is in very nice shape. The movement is in great shape. I could stand to be cleaned but otherwise there are no signs of rust or corrosion. So what's the cause of the non-turning crown? Here's a shot of the dial again without the crystal in the way. It's really odd, isn't it? It's almost like the dial was partially submerged in coffee. If it was one consistent tone I'd be tempted to leave it as is but the 50:50 pattern is a bit of a distraction, in my opinion. Here's a shot mid-stream of the reassembly process. The toughest part of this movement is to get the large train bridge back in place. 3/4 of the back seems to be covered by the train bridge. The movement is now running, without the rotor installed, so it's really just a mechanical hand-winding movement at the moment. Nothing to complain about here... good amplitude, low beat error and just a smidge fast at 11 seconds fast per day. It will slow slightly after it runs a while. A new crystal is in order for such a nice looking case. Well, cleaning the dial was a bit of a gamble and in this case it didn't pay off. As the saying goes, "you pays your money and you takes your chance". Despite the pasty uneven tone of the dial, it proved exceptionally resilient to being cleaned. As a general rule, I never clean a dial that I'm not willing to get refinished. I was almost certain that I'd be able to clean it up better than it was, and I did lighten it a little but eventually the finish started to degrade. So I'll send this out to my friends at International Dial Co and see what they can make of it. It's actually a fairly simple pattern... we'll see. I sent the dial out to be redone and they did it with a two-tone silver butler finish. It think it turned out fairly well although the border between the inner circle and the outer ring is a little wavy, as if it was done by hand. The minute track is a bit heavy too. It's not too, too bad though. I think it's very interesting how some models never made it into the catalogs. One of the earliest examples is the 1928 Oval and another is the 1931 Clinton. The model name was re-used in the 1949 with another Clinton model - but that one did make the catalogs. The 1931 Clinton was made for two years. The Clinton came in a 14K gold filled case in either white or yellow gold. A similar model in sterling silver was called the Greeley. So this style model is called the Clinton / Greeley but technically only the silver version is the Greeley. Less than 1,700 were made so they are exceptionally scarce - especially in nice shape. One of the facets that make the original Clinton interesting is it's one of the first models to come on a metal bracelet. 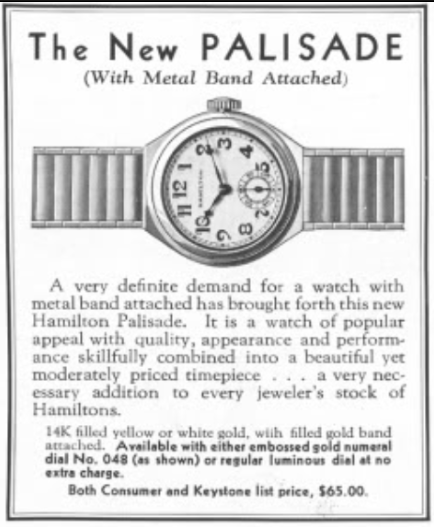 Technically that honor (first use of bracelet) is held by the 1931Palisade but that's really just because the Palisade did make the catalogs. I suppose you could say it depends on what the definition of first is. Anyway, inside the gold filled (or silver) case you will find a 17 jewel 987F movement. Another interesting factoid with the model is it later came with lugs so that a strap could be mounted. When equipped with the bracelet, the bracelet was integral to the bezel so it was not removable and a strap could not be installed in it's place. I have yet to see a strap Clinton in the flesh but I have seen a couple of photos. I believe they are uber-rare. Well, as fate would have it, I recently landed a Clinton project watch. They are very hard to come by in nice shape. Typically the bracelet is a mess and the bezel is heavily worn through. However, in my case, I scored what I thought was a pretty decent example. As you can see below, this is a bracelet example but the bracelet is gone except for a couple of links on each side. Someone got creative and put holes in the side of the outermost link so a 16mm strap can fit inside with a spring bar. The dial appears to be original and it's is fair shape. There are some scratches and it appears to have been cleaned free of lume. The hands still have radium and I could leave it as is but I personally prefer to get these old dials redone so they look good and are radium-free. The movement is in nice shape but could stand a good cleaning. This is an early 987F I think. Based on the tables I use this is a 987 serial number but it's clearly a 987F. That's rather odd, I think. Maybe the movement is a replacement but I suspect it was just in inventory for a while before it was used. A new glass crystal will be a nice replacement over the current plastic one. There's nothing wrong with plastic, I just prefer glass. While all the parts are in the ultrasonic, I'll show you something you may not have known. Inside the case back of the watch is a serial number. The number doesn't really mean much as cases were ordered in batches and it's possible that the next number is actually a different model. However, the last four digits of the case serial number is used to match the bezel. Inside a two-piece case, the same four digits are hand-scratched onto the inside surface. Pseudo-roman numerals are used so if you look closely you'll see VII III II VIIII for 7329. When the case has three parts, the center is stamped and the front bezel is scratched like shown below. When all three (or two) sets of numbers match, you know they left the factory together. All the parts are cleaned and dried before being reassembled. The movement is now back together and running so it's off to the timer. What's wrong with this picture? The beat rate is too high at 19,800 (it should be 18,000). The timer chooses the beat rate so that's an indication that there's a problem. The pattern looks like random noise too - so something is clearly going on with the balance. These 1930's 987 variants can be a royal PITA sometimes and they are very finicky. You need to really look very closely at the hairspring to make sure it's not hung up or banging into something like the center wheel. I look through a 10X loupe from the angle below to see what the hairspring looks like. The hairspring leaves the stud, passes through the regulator fork, then turns sharply to pass over the hairspring coil until it turns again and drops to form the outer most coil of the spiral. This one looks fine - which is good because reshaping hairsprings is very difficult. Recleaning the balance and running the works through the demagnetizer seemed to do the trick. It's running just fine now. And here's the finished project - all dressed up with a nice vintage strap and with a refinished dial and hand set to boot. It looks pretty spiffy now, if I do say so myself. My merciless camera reveals the wear through on the bracelet but it looks much better in person. This is a sharp-looking watch and I kind of like the bracelet / strap combination. It's good to know that a Clinton with a broken bracelet can be saved.